Welcome to the Clote Lab Inverse Folding website ! RNA Synthetic design. Simple 3-step pipeline to design synthetic RNAs that fold into the consensus structure of a user-selected Rfam family. Sequence constaints are automatically generated for those positions, whose sequence conservation in the Rfam seed alignment exceeds a user-specified threshold -- since functionally important nucleotides (e.g. the active site) are known to be conserved, this step improves likelihood of designing a functionally active synthetic RNA. Additional constraints and structural compatibility/incompatibility requirements can be enforced. RNA-CPdesign. Given a target structure and optional sequence constraints, CPdesign uses Constraint Programming (CP) to determine one or more RNA sequences that fold into the given target structure. CP performs a complete exploration of the search space, and, thus can also prove that no sequence folds into the target structure exists. Since computation time may be exhorbitant, the latter is only feasible for sufficiently small structures. RNA-LNSdesign. RNA-LNSdesign in now embedded as an option into RNA-CPdesign. Given a target structure and optional sequence constraints, LNSdesign uses Large Neighborhood Search (LNS) to determine one or more RNA sequences that fold into the target structure. LNS is a heuristic, that calls CP as a subroutine, which is suitable for larger structures. Since LNSsearch is a heuristic algorithm, it cannot prove the nonexistence of a solution to an inverse folding problem. 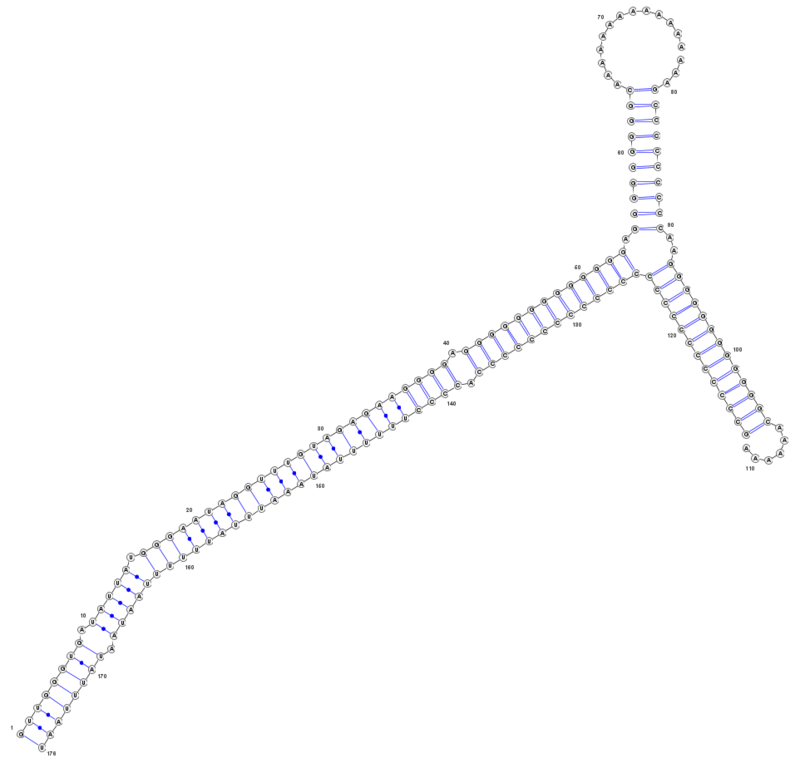 This is the minimum free energy secondary structure of an Oryza Sativa RNA, proposed as inverse folding problem "Oryza Sativa 4" on the EteRNA web site. Target sequence must have as most 40 GC pairs and at least 10 GU pairs. Graphical representation of the minimum free energy (MFE) secondary structure using VARNA. Juan Antonio Garcia-Martin, Peter Clote, Ivan Dotu. RNAiFold: A constraint programming algorithm for RNA inverse folding and molecular design. J Bioinform Comput Biol 11(2): 1350001, 2013. Garcia-Martin JA, Dotu I, Clote P. RNAiFold 2.0 A web server and software to design custom and Rfam-based RNA molecules. Nucleic Acids Research Web Server issue, 2015, doi: 10.1093/nar/gkv460, RNAiFold 2.0 A web server and software to design custom and Rfam-based RNA molecules. Examples of how to use RNAiFold to design synthetic hammerhead ribozymes and temperature switches (thermo-IRES elements (temperature switches for internal translational start site) are here. Garcia-Martin JA, Dotu I, Fernandez-Chamorro J, Lozano G, Ramajo J, Martinez-Salas E, Clote P. RNAiFold2T: Constraint Programming design of thermo-IRES switches. Bioinformatics. 2016 Jun 15;32(12):i360-i368. doi: 10.1093/bioinformatics/btw265. Dotu I, Garcia-Martin JA, Slinger BL, Mechery V, Meyer MM, Clote P. Complete RNA inverse folding: computational design of functional hammerhead ribozymes. Nucleic Acids Res. 2015 Feb 1;42(18):11752-62. doi: 10.1093/nar/gku740. Epub 2014 Sep 10. RNAinverse software: I. Hofacker, W. Fontana, P. Stadler, L. Bonhoeffer, M. Tacker and P. Schuster. Fast folding and comparison of RNA Secondary structures. Monatsh Chem. 125:167-188 (1994). RNA-SSD software: M. Andronescu, AP. Fejes, F. Hutter, HH. Hoos and A. Condon. A new algorithm for RNA secondary structure design. J Mol Biol. 336: 607-624 (2004). InfoRNA software: A. Busch and R. Backofen. INFO-RNA - fast approach to inverse RNA folding. Bioinformatics 22 15:1823-1831 (2006). Modena software: A. Taneda. MODENA: a multi-objective RNA inverse folding. Advances and Applications in Bioinformatics and Chemistry 4:1-12 (2011). Supported by NSF DBI-1262439. Any opinions, findings, and conclusions or recommendations expressed in this material are those of the authors and do not necessarily reflect the views of the NSF.